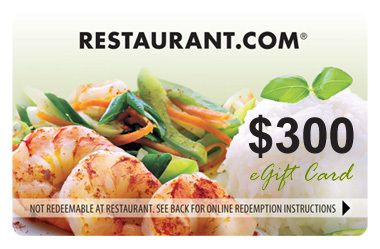 NOW ONLY $80 for a $400 Restaurant.com e-Gift Card! Restaurant.com allows diners to discover new restaurants-and enjoy eating at old favorites-at a discount. These e-Gift Cards also make excellent gifts for birthdays, anniversaries and thank yous. • May purchase multiple deals. Customers may select any number of restaurants and denominations over time, totaling their total eGift card value. No cash value. e-Gift Card must be redeemed online before using in restaurants. There may be minimum spend requirements at participating restaurants and online merchant websites. Refer a friend credits not valid for this deal. Cannot be combined or used in conjunction with any other offer, coupon or promotion. • After purchasing, visit http://dine.restaurant.com and enter your Egift card code to receive your Egift card. • Customers may select any number of restaurants and denominations over time, totaling $400. • Not valid for cash value. • Gift card must be redeemed online before using in restaurants. • There may be minimum spend requirements at participating restaurants and online merchant websites. • Cannot be used in conjunction with other deals. After receiving your e-Gift Card Code, visit http://dine.restaurant.com to redeem $400 worth of e-gift card to participating restaurants. Restaurants large and small partner with Restaurant.com, and you'll be able to satisfy cravings for any type of cuisine. Bon appétit! 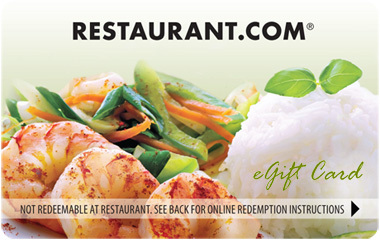 Your e-gift card must be redeemed at http://dine.restaurant.com and is not a valid form of payment at any restaurant. For ONLY $10 You Get a $50 Restaurant.com eGift Card! We hand select each and every deal for our customers… enjoy!